Snapshot: The Stihl FS 38 petrol line trimmer has 2 cutting lines and weighs 4.6kg. But how effective and easy to use is it? 04 Sep 2017, Gavin S.
Seems well made, Starts well, reliable brand. I tried the trick of removing the lanyard and penny washer from the fuel filler cap. Seemed to improve the running slightly when the cutting vertical edges, the motor still tended to die when upside down but would recover more quickly when shaken or rotated so the curtting disc is horizontal. Still, the fuel system should be better than this. 20 Aug 2017, Gavin S.
See this site for the Australasian experience. 18 Aug 2017, Gavin S.
On my Stihl I have removed the fuel filler cap lanyard and big plastic penny washer that retains the lanyard in the tank in an effort to eliminate the possibility that the penny washer is preventing the fuel pick up filter from following the fuel at various positions of operation. I will let you know how that goes. 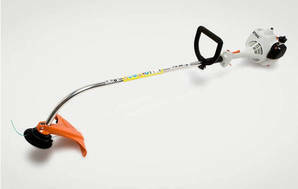 I like to use these power tools for vertical edging of paths, driveways, garden beds etc. My two previous McCullochs worked well for this mode and their fuel tank positions meant that the engine could run well in many different positions. I was surprised when my new Stihl FS-38 lost power and began to die until I rotated the tool so that the fuel tank was again on the right side of the motor and the cutting disk was horizontal, then the engine picked up speed again. Seems to be a common complaint for these Stihl Line trimmers on overseas forums. The fuel tank and pick-up design lets it down.